Gtk.AppChooserDialog shows a Gtk.AppChooserWidget inside a Gtk.Dialog. Note that Gtk.AppChooserDialog does not have any interesting methods of its own. Instead, you should get the embedded Gtk.AppChooserWidget using Gtk.AppChooserDialog.get_widget() and call its methods if the generic Gtk.AppChooser interface is not sufficient for your needs. To set the heading that is shown above the Gtk.AppChooserWidget, use Gtk.AppChooserDialog.set_heading(). Creates a new Gtk.AppChooserDialog for the provided Gio.File, to allow the user to select an application for it. 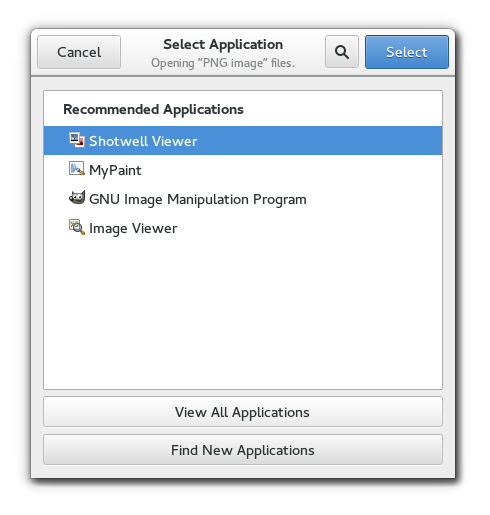 Creates a new Gtk.AppChooserDialog for the provided content type, to allow the user to select an application for it. Returns the Gtk.AppChooserWidget of this dialog. The Gio.File used by the Gtk.AppChooserDialog. The dialog’s Gtk.AppChooserWidget content type will be guessed from the file, if present.